The pendant is made of sterling silver with bright pink tourmaline with a checkerboard facet finish and cubic zirconia stones. The pendant is made of sterling silver with sugilite and sapphire imitation stones. The pendant is made of sterling silver with a turquoise and cubic zirconia stones. The pendant is made of sterling silver with sugilite, fresh water pearl and sapphire imitation stones. The pendant is made of sterling silver with gem silica, fresh water pearl and cubic zirconia stones. The pendant is made of sterling silver with tourmaline and cubic zirconia stones. The pendant is made of sterling silver with aquamarine, fresh water pearls and cubic zirconia stone. The pendant is made of sterling silver with larimar and cubic zirconia stones. The pendant is made of sterling silver with dichroic glass, tourmaline, sapphire imitation sone and cubic zirconia stones. The pendant is made of sterling silver with rough aragonite, fresh water pearl, emerald and saphire imitation stones. The pendant is made of sterling silver with a druzy of rough smokey crystals, fresh water pearl, tourquoise and cubic zirconia stones. The pendant is made of sterling silver with ocean jasper. The pendant is made of sterling silver with chrisoprase, fresh water pearls and emerald imitation stones. The pendant is made of sterling silver with smokey quartz, fresh water pearls and cubic zirconia stone. The pendant is made of sterling silver with Fluorite, labradorite and sapphire imitation stones. The earrings are made of sterling silver with rainbow monnstones and fresh water pearls. The earrings are made of sterling silver with cubic zirconia stones. 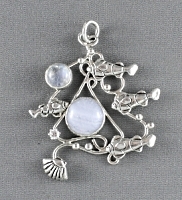 The pendant is made of sterling silver with rainbow moonstone, blue lace agate and cubic zirconia stone. 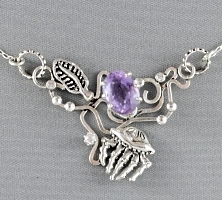 The pendant is made of sterling silver with amethyst and cubic zirconia stone. The pendant is made of sterling silver with tourmalated quartz and cubic zirconia stones. The pendant is made of sterling silver with kyanite, sapphire imitation stones and cubic zirconia stone. The pendant is made of sterling silver with larimar and cubic zirconia stone. 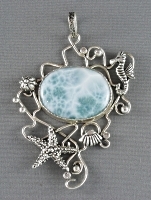 The pendant is made of sterling silver with larimar. The earrings are made of sterling silver with fresh water pearls. The earrings are made of sterling silver. 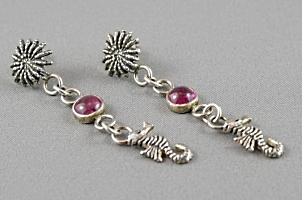 The earrings are made of sterling silver with tourmaline.